צד אחד דמות הבא מהניקל התאו משנת 1913שבו מופיע אנדיאני אמריקאי והמילים "Liberty 2017"
הפוך Image of a bison and the words "United States of America E Pluribus Unum In God We Trust $50 1 oz 9999 Fine Gold"
דמות הבא מהניקל התאו משנת 1913שבו מופיע אנדיאני אמריקאי והמילים "Liberty 2017"
מטבע זהב תאו משנת 2017 משקל אונקיה Buy the only 9999 pure gold coin produced by the US mint, the 1 o 2017 Buffalo gold coin at the lowest price online. The design of these coins has been replicated from the original Buffalo nickel, first released in 1913. 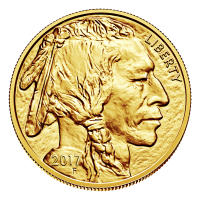 The obverse displays a side profile view of a Native American and the word Liberty, The reverse features an image of a bison that lived in New York's Central Park in the early 1900's, named Black Diamond. This coin is a replica of the early Type I nickel, which were only produced in 1913 and 1914. These coins are a favourite of bullion investors, order yours today!